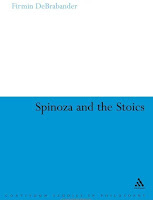 "This important book considers Spinoza’s engagement with the themes of Stoicism and his significant contribution to the origins of the European Enlightenment. Firmin DeBrabander explores the problematic view of the relationship between ethics and politics that Spinoza apparently inherited from the Stoics and in so doing asks some important questions that contribute to a crucial contemporary debate. Firmin DeBrabander is Assistant Professor of Philosophy at the Maryland Institute College of Art, USA. PB 978 0 8264 2181 4 • £24.99"